Habit: Blutaparon vermiculare grows as a low succulent, forming large mats from rhizomes that branch frequently, to 7 m (usually shorter) with the lower stems becoming woody over time. The stems are photosynthetic. The leaves are arranged oppositely, succulent, linear, with an entire margin and acute leaf apex. The complete, perfect, actinomorphic flowers are arranged in slightly elongate heads in leaf axils. The calyx has 3 unfused sepals. The corolla has 5 unfused white petals. There are 5 stamens fused at filament base. The superior ovary has a single locule and seed. The fruit is an achene at maturity. 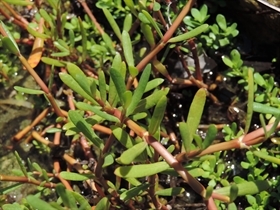 Habitat: Blutaparon vermiculare grows in saline areas along the coast or edges of mangrove flats. Medicinal/Cultural/Economic usage: Blutaparon vermiculare is not used medicinally in the Bahamian Archipelago.